Evolution Edges is excited to announce we have been awarded a Sourcewell Contract for the “Snow and Ice Handling Equipment” category for the 2019-2022 term. This contract, #080818-EVE went into effect on October 29, 2018. Sourcewell (formerly NJPA), a national cooperative purchasing organization, awarded the contract to Evolution Edges following a nationwide, competitive solicitation process. Evolution Edges' awarded contract with Sourcewell allows purchasers from public entities to save time and money by streamlining the procurement process with cooperative purchasing. This contract offers the ability to purchase snow plow wear parts (cutting edges, plow shoes, curb guards, grader blades and sander chains) from us without having to duplicate the bidding process, because Sourcewell has already done it for their members. “We are excited to offer Evolution Edges products through Sourcewell. This will provide great benefit to our existing and future customers, making purchasing a smooth, simple process with no need for bidding,” said Daren Lynch - Director of Business Development of Evolution Edges. Once you have a Sourcewell Member ID number, contact us and let us know you are interested in using the Sourcewell contract – we'll do the rest! 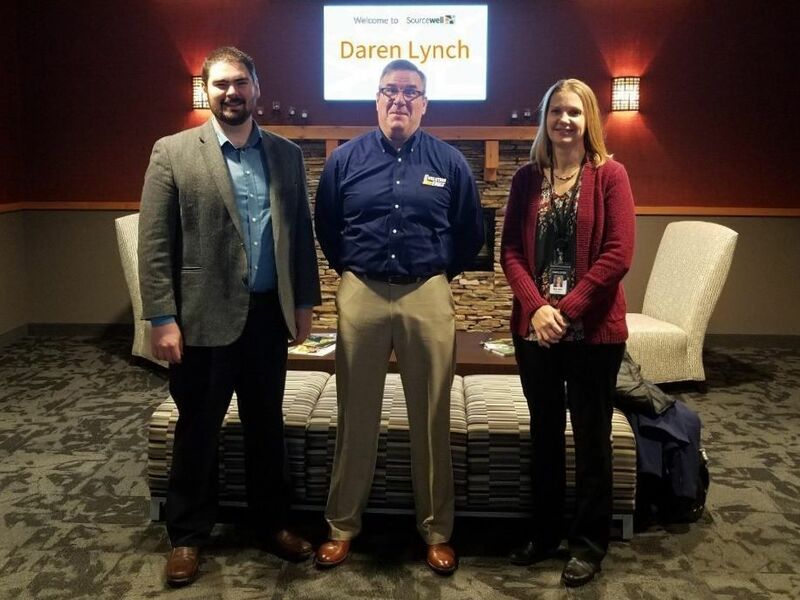 Sourcewell representatives Nicholas Trout and Karen Otremba with Evolution Edges' Daren Lynch, Director of Business Development, at the official Sourcewell contract launch.